They were in colorful kimonos this year, too. 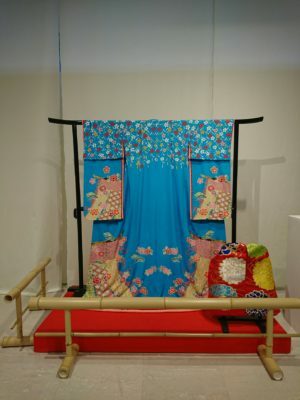 And the kimono worn at the show was on display. from one of my acquaintances, and went to see it on the final day. The show was magnificent as always. Not to mention the gorgeous dance by Maiko and Geiko, the skilled Jikata’s shamisen performance was really amazing. I was impressed to see that they made an effort to present it in new ways while preserving the tradition. There was a space where the visitors could enjoy watching exhibitions and taking photos. I learned a lot from their approach to entertain the guests.